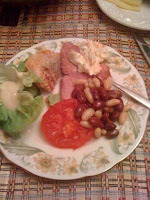 I just had to add this image my hubby emailed it to me from the UK, he went to see his sister with back pain, today he went to visit my Grandparents and he ate this and tea and her famous chocolate cake, wish me and Jasmine were there. Aw well I spoke with everyone on skype, and took my father in law safely to the airport for his long journey back to India. My Mum in Law returns here in a week, so will get some more Indian recipes for us all, will be stocked up on tea and British goodies again soon. I am blessed to have a lovely family, what have your family done to support your love of food? What haven't I done? Whenever I can, I try to talk with my grandmothers about recipes, and if I am with them, I try to cook their recipes. It's always fun and it's more recipes to add to my recipe binder. I just heard about Skype the other day! What a neat way to keep in touch. I love Indian food, and my clients mom (they are Indian) is here for a few months, as she retired recently, and has cooked for me, YUM! We like the Shanghainese food my mom cooks and my family/relatives like the food I cook for them, so I guess that's how and when I started building my passion for food and cooking. Skype is pretty awesome especially with international calling. Amazingly my family and friends a pretty much open to any and most foods, so I'm pretty lucky that I don't have to be careful in what I have to cook or order at a restaurant. lovely salad n it's so good to see a caring close knit family. i have got all my cooking lessons from family ..
Oh, my family supports my love of cooking by eating everything I do with a smile! They've put up with me!!! LoL. looks healthy.. my hubby too takes photos or suggests ingredients for recipes some times.. aren't hubbies sweet?? Looks healthy (your influence, I guess? healthy diet.) yet yummy. Angie oh my Gran is pretty health consious she just eats way too much cake!! !